Originally a postal inn accommodating travelers following the mail route, Stalheim Hotel was built in 1750 with humble amenities and only 20 beds. 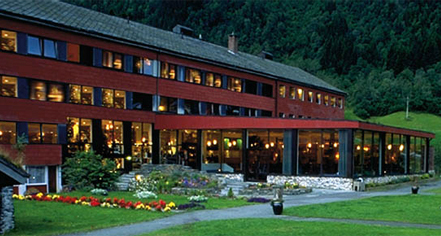 With centuries of experience, renovation, and expansion, Stalheim Hotel today is a family-run business boasting 124 comfortable guestrooms, a delicious restaurant and bar, and meeting spaces, all with expansive panoramic views of the breathtaking Nærøyfjord and Nærøy Valley. Rich in heritage and tradition, Stalheim Hotel invites a gracious ambiance with spectacular surroundings and attractions that have impressed and inspired the work of many artists, many featured on the walls of the hotel. Stalheim is passionate about promoting the lasting impression nature can offer with guided tours and hikes along the many easily accessible trails. 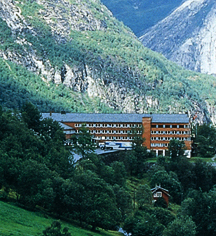 A cultural treasure with an impressive history, Stalheim Hotel is a choice destination to enjoy Norway's mountain life. Stalheim Hotel, a charter member of Historic Hotels Worldwide since 2011, dates back to 1750. The hotel was originally a postal inn accommodating travelers on a mail route, and had only 20 beds. Airport Transportation: Available, may be scheduled through the hotel's concierge, rates apply. Cribs and Pack-in-Plays: Not available. Deposit: Credit card deposit required at time of check-in. Early Check-In/Late Check-Out: Subject to availability. Hotel/Resort Fees & Taxes: All reservations may be subject to additional taxes. Occupancy Restrictions: Varies by room type. Parking: Self-parking: Available; complimentary. Valet parking: Available; complimentary. Rollaways: Available upon request; complimentary. Shuttle Service: Shuttle service to and from the airport may be scheduled through the resort's concierge. Rates apply. Transportation: Transportation, including an airport shuttle, may be arranged through the concierge; rates apply. Originally a postal inn accommodating travelers following the mail route, Stalheim Hotel was built in 1750 with humble amenities and only 20 beds. Learn more about the History of Stalheim Hotel .